Founded in 1894 by Milton S. Hershey, The Hershey Company has a longstanding history as the chocolate and confectionery leader in North America. Their portfolio of more than 80 brands includes such iconic favorites as Hershey’s, Reese’s, Hershey’s Kisses, Jolly Rancher, and Ice Breakers. The Hershey Company has been headquartered in Hershey, Pennsylvania, for more than 150 years. Approximately 21,000 Hershey employees worldwide work every day to bring goodness to the world through great tasting snacks. Between 2012 and 2013, satisfaction with Recognition and Reward dropped 8% on Hershey’s “Many Voices” employee survey. Many disparate cash reward programs were limited in scope and created an inconsistent employee experience across the company. Globoforce designed the Hershey SMILES program to strengthen the company’s four values: open to possibilities, growing together, making a difference, and one Hershey. This one consistent recognition approach allows for peer-to-peer and mobile recognition to drive more employee engagement. 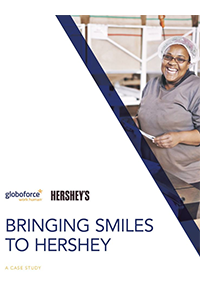 Globoforce’s social recognition program enables easy program accessibility for Hershey’s diverse global workforce. In the first two years of SMILES, more than 100,000 recognition moments have been delivered, with 81% country-to-country recognition. In this webinar we discuss how The Hershey Company built a successful program that is global, yet locally relevant, and unites employees with a single set of culture values.